Hosting a party this summer? Put the pineapple front and center and embrace the popular trend we’re seeing in everything from T-shirts to home accessories. This visually fun fruit, the icon of hospitality, lends itself well to a theme, whether you’re envisioning an all-out tropical soiree or looking for an easy, elegant motif to build your party around. 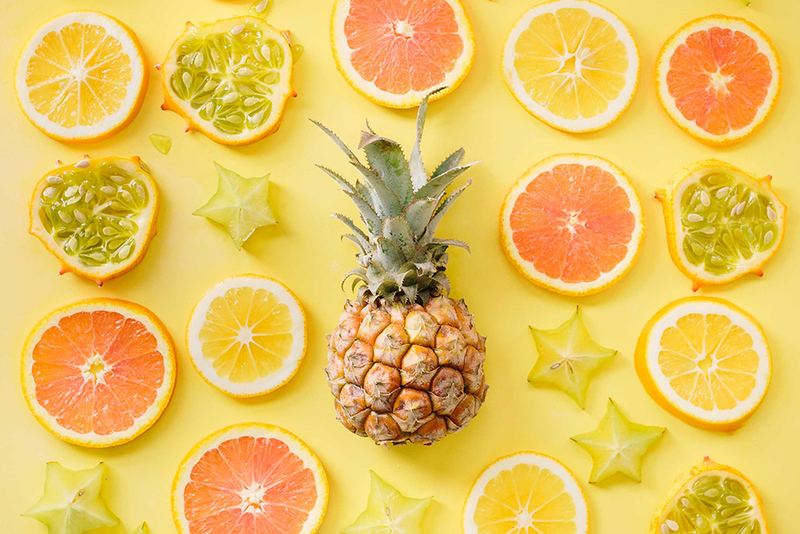 The pineapple even works for kids’ parties, offering up loads of whimsy and inspiration for everything from playful, “poppy” decorations to sweet and healthy snacks. So began the journey of the humble pineapple to its historical place of prominence in architecture, design, and décor. (Think finials and door knockers.) This classic symbol of hospitality has never gone out of style — it continues to reinvent itself in fresh and modern ways, including the re-emergence we’re seeing today as a home accessory that complements any decorating style, whether elegant, modern, traditional or eclectic. Whatever your personal style, good cheer, warmth and affection are always in fashion. Use our favorite DIY décor and food ideas that are easy to execute and sure to make a splash, whether it’s a bold statement or subtler effect you’re after. Either way, you’ll set an inviting tone sure to impress guests, put them at ease and dish out a healthy dose of fun. This DIY centerpiece really pops, making it perfect for baby and bridal showers, birthday parties, and more. Make an impact with a DIY pineapple piñata. This elegant centerpiece is budget-friendly and oh-so-easy. Customize it with your favorite flowers, and it’s perfect for any occasion. The beauty’s in the detail. Create an immersive experience for partygoers with Pineapple Sorbet, Pineapple Pucker, or By the Sea scents. Speaking of hospitality … we want to extend a heartfelt Scentsy welcome to you. Thanks for visiting us! And if you’re thinking about joining, you won’t find a more hospitable group! To get your Scentsy pineapple favorites now (our Southern Hospitality Warmer makes a perfect housewarming or hostess gift ? ), contact your Scentsy Consultant. Or find a friendly Consultant at scentsy.com. Separator image Posted in Home Décor, Our Products, Tips & Tricks.